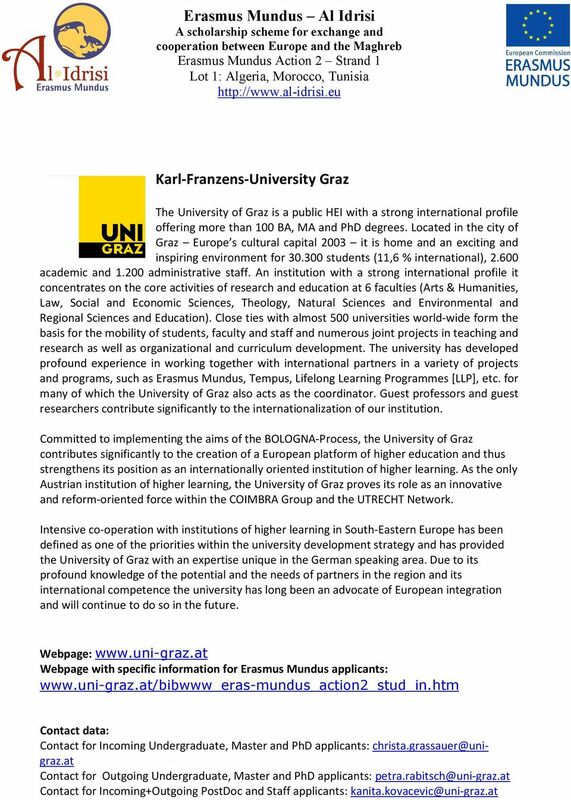 5 - Mailing address Karl-Franzens University of Graz Büro für Internationale Beziehungen Universitätsplatz Graz, Austria - Contact persons for incoming students (Bachelor, Master, PhD) for outgoing students for incoming staff & PostDoc for outgoing staff & PostDoc Mag. Christa Grassauer Tel: Mag. Petra Rabitsch Tel: Mag. Kanita Kovacevic Tel: Mag. 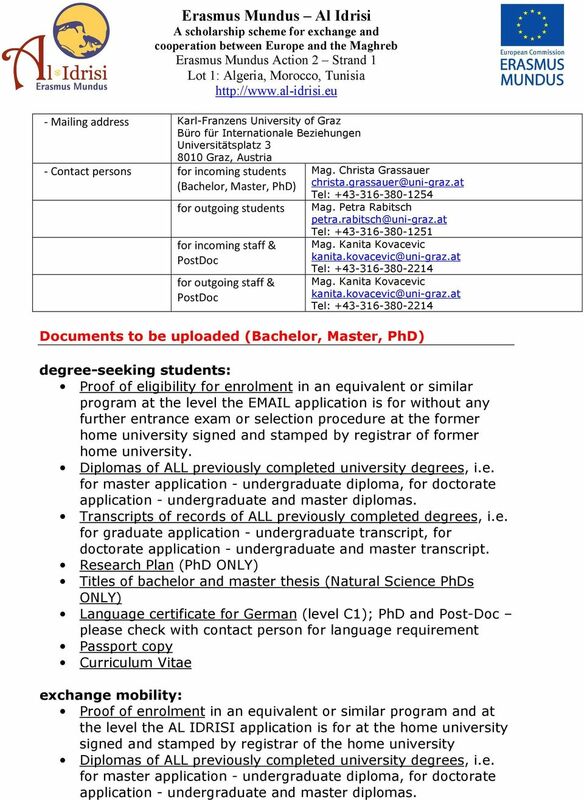 Kanita Kovacevic Tel: Documents to be uploaded (Bachelor, Master, PhD) degree-seeking students: Proof of eligibility for enrolment in an equivalent or similar program at the level the application is for without any further entrance exam or selection procedure at the former home university signed and stamped by registrar of former home university. 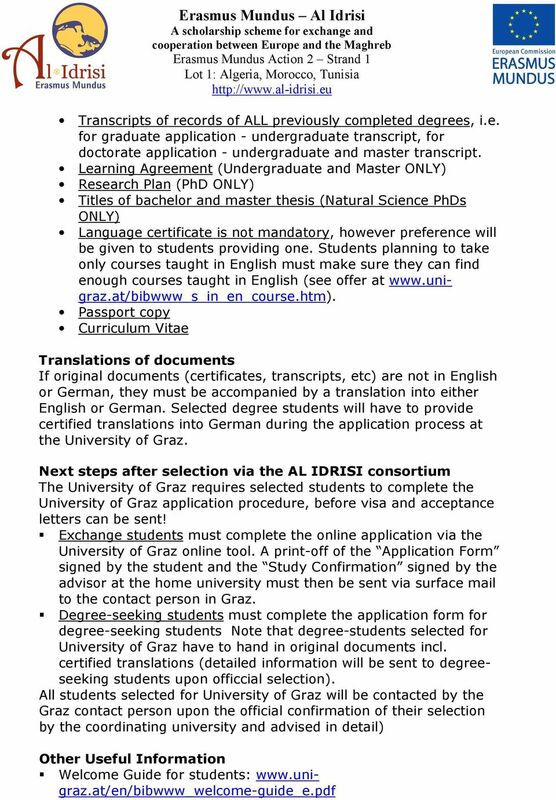 Diplomas of ALL previously completed university degrees, i.e. for master application - undergraduate diploma, for doctorate application - undergraduate and master diplomas. Transcripts of records of ALL previously completed degrees, i.e. 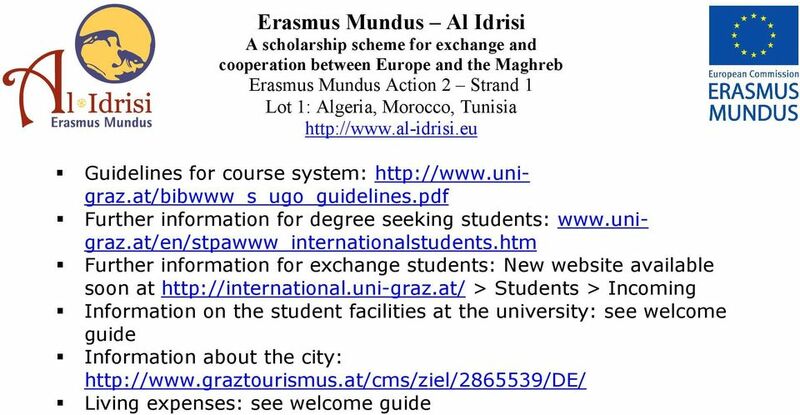 for graduate application - undergraduate transcript, for doctorate application - undergraduate and master transcript. 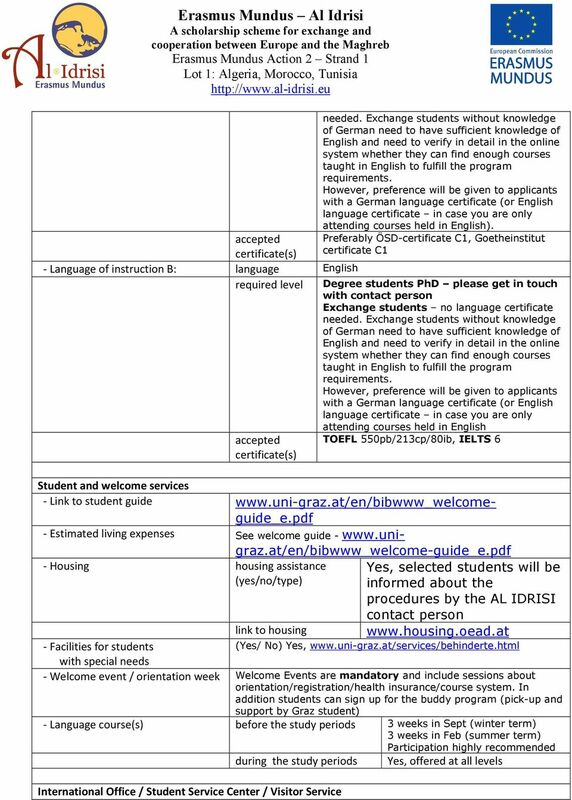 Research Plan (PhD ONLY) Titles of bachelor and master thesis (Natural Science PhDs ONLY) Language certificate for German (level C1); PhD and Post-Doc please check with contact person for language requirement Passport copy Curriculum Vitae exchange mobility: Proof of enrolment in an equivalent or similar program and at the level the AL IDRISI application is for at the home university signed and stamped by registrar of the home university Diplomas of ALL previously completed university degrees, i.e. 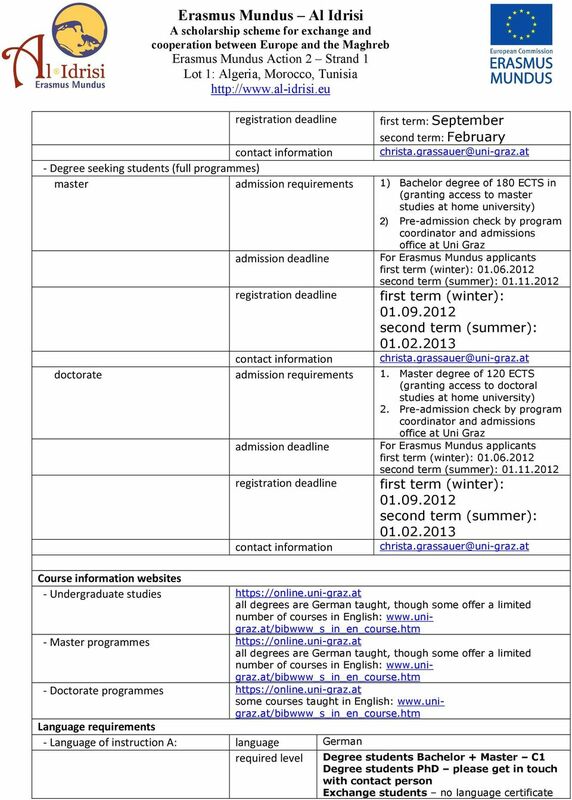 for master application - undergraduate diploma, for doctorate application - undergraduate and master diplomas. 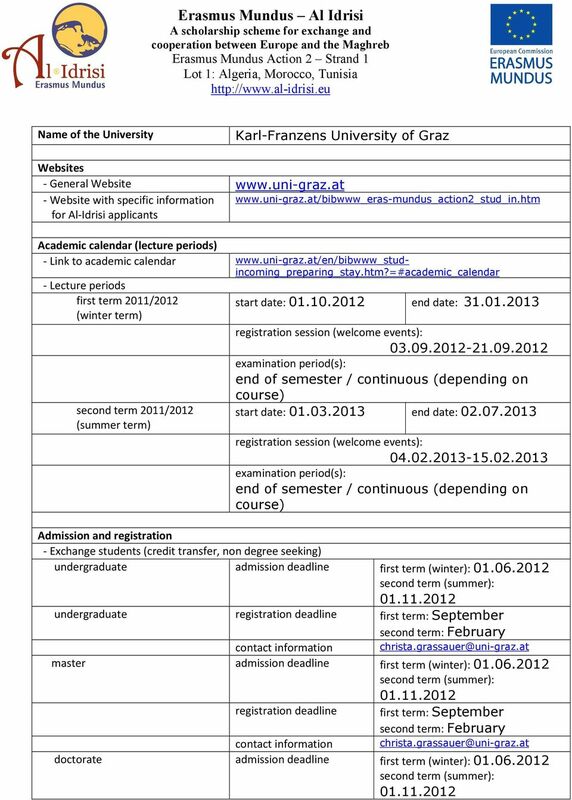 Full Legal Name of University University Address President Website ERASMUS Code ECHE Number Hochschule für Technik, Wirtschaft und Kultur Leipzig Karl-Liebknecht-Straße 132 04277 Leipzig, Germany Prof.
Sookmyung Women s University. Seoul, South Korea. Name: Melissa Hasol Kim(Ms.) Email: Inbound.exchange@sm.ac.kr. http://e.sookmyung.ac. WELCOME TO AALBORG UNIVERSITY DENMARK!